Want to learn how to tile a backsplash in your kitchen?? 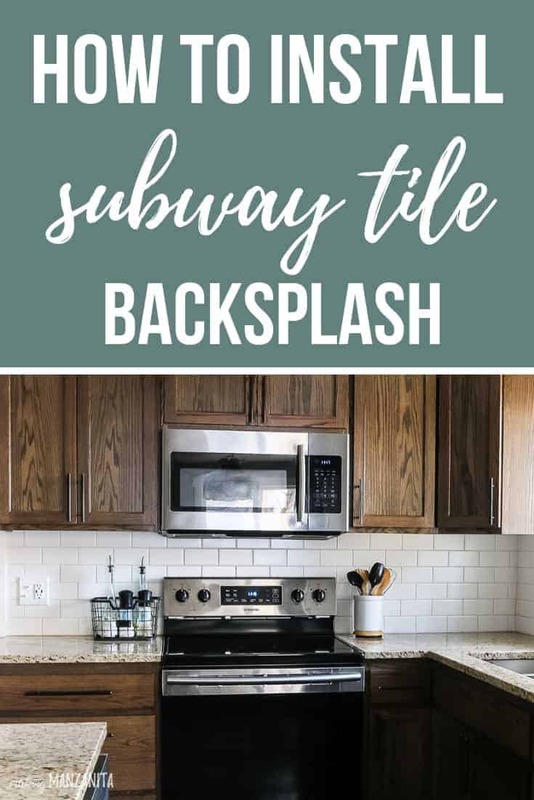 In this post, we will walk you through the step by step process for how to install subway tile backsplash using tile adhesive! Bonus: there’s a video tutorial too! The first time I ever walked into this kitchen, the first thing I noticed was the backsplash. Specifically, how much I hated it. I didn’t let it cloud my vision though when we decided to purchase this fixer upper (see all the before pictures & read our renovation plans here). I knew it would be fairly simple to replace the backsplash and I also knew that subway tile was pretty cheap. Here’s what we were starting with…. Ok…first of all… Have you EVER SEEN rectangular tile installed vertically? It just looks so ODD to me. Secondly… I am on a mission to remove the tan from this house, haha! 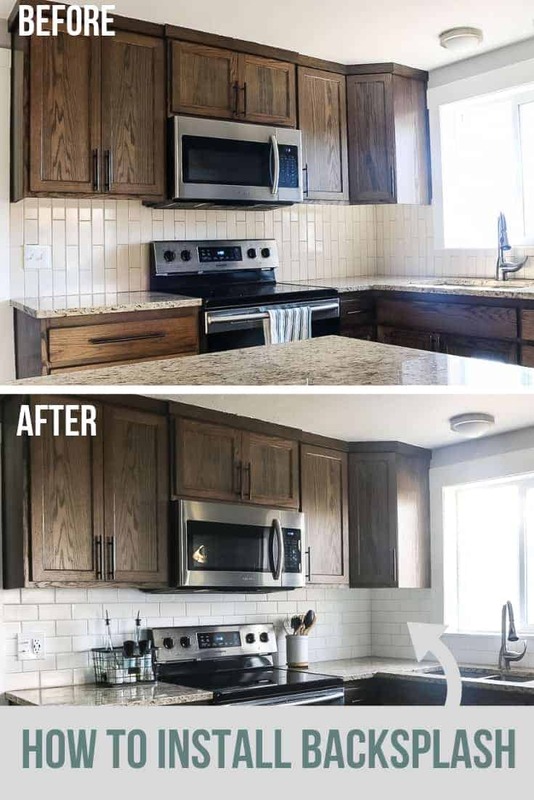 It’s a total personal preference, but I’m not a big fan of tan…so we’ve painted over ALMOST all of the tan walls and now we’ve finally gotten rid of the tan tile backsplash. 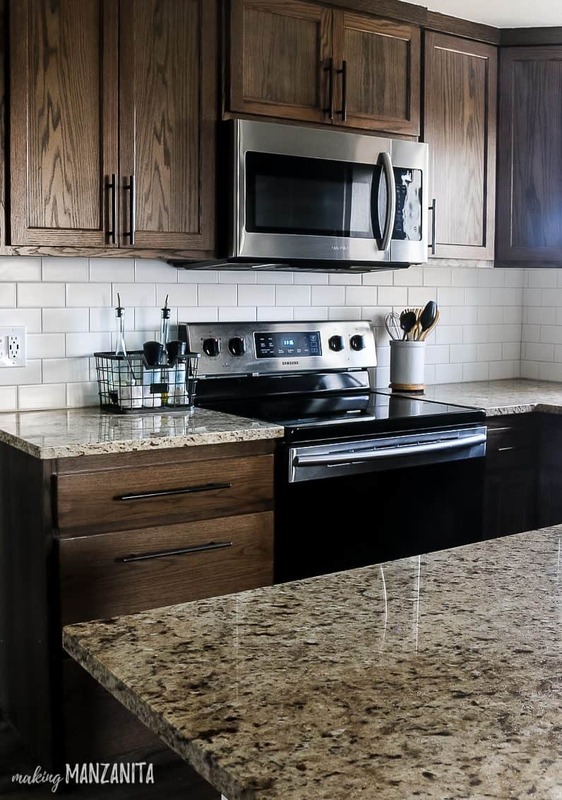 There’s probably nothing I’m ever going to do about those countertops because….honestly, countertops are expensive and these are basically brand new. They were installed right before we moved in by the flippers that we purchased this house from. Not what I would have chosen, but they aren’t THAT bad. 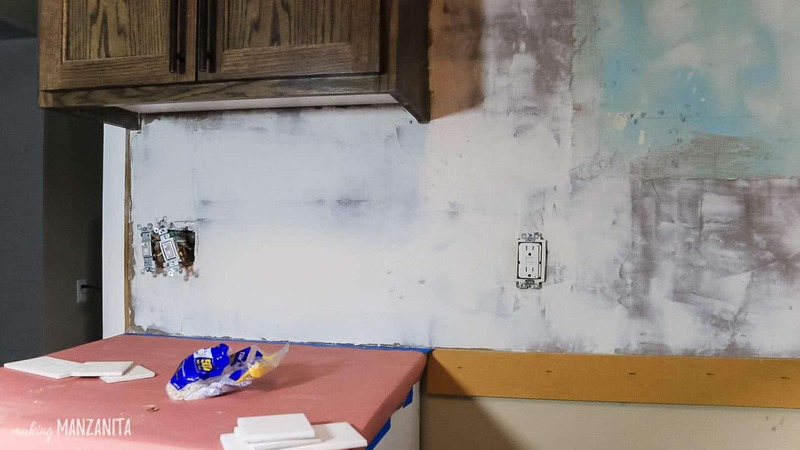 So, we knew we wanted to tackle a new kitchen backsplash at some point. But it wasn’t until Logan stumbled upon 3 boxes of white subway tile for only $15 (yes, you read that right…!) at our local ReStore that this project really started to take shape. One of the great things about having your renovation projects mapped out way in advance is that you can keep your eye out for discounted materials, like this awesome score. If you missed last week’s post, you definitely want to start there. 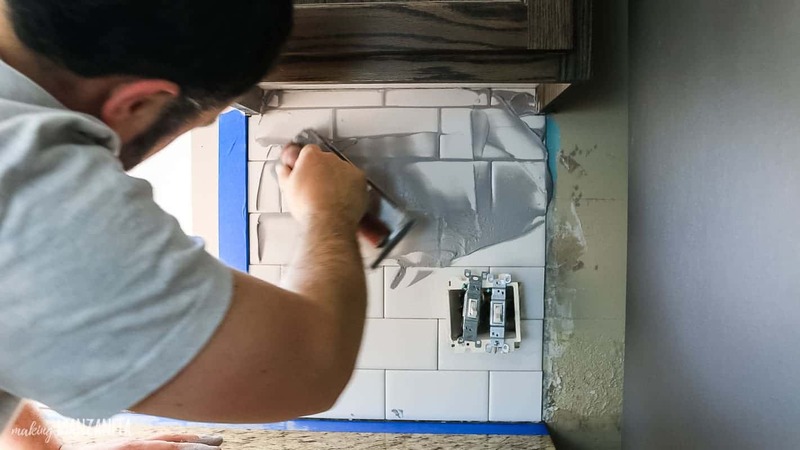 Logan walked you through how to remove tile, which is a super important step if you are learning how to install subway tile backsplash. 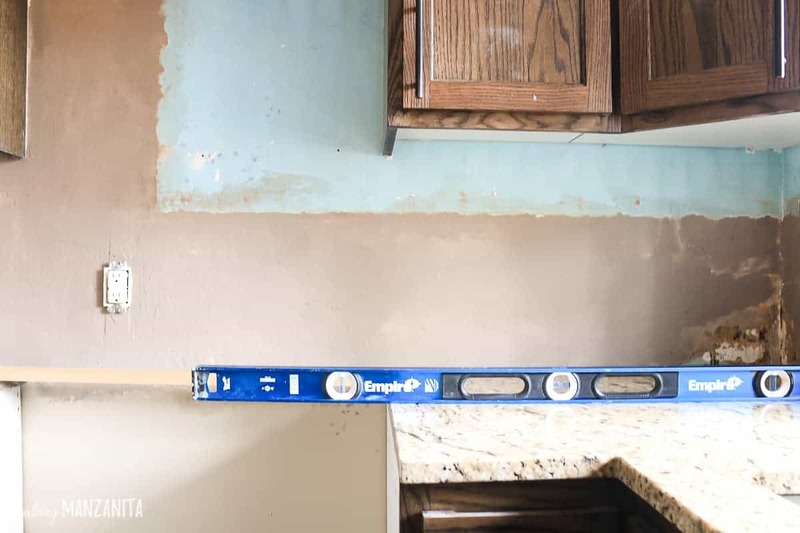 Now today we’re going to assume that you’re starting with all of your old tile removed and your wall where you will be installing the tile backsplash is flat. Are you ready to jump right in and learn how to tile a backsplash? Ok, ok… hold your horses for just a sec. 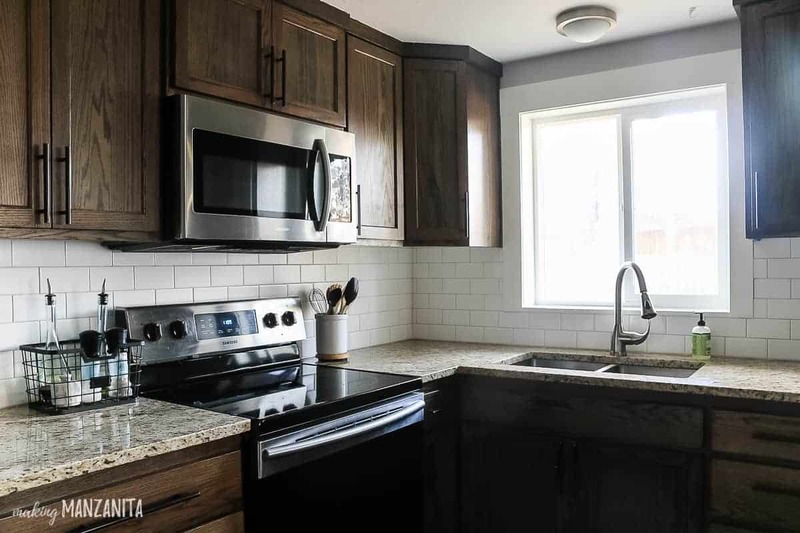 Before we get started learning how to tile a backsplash, I want to cover to a couple of questions first. 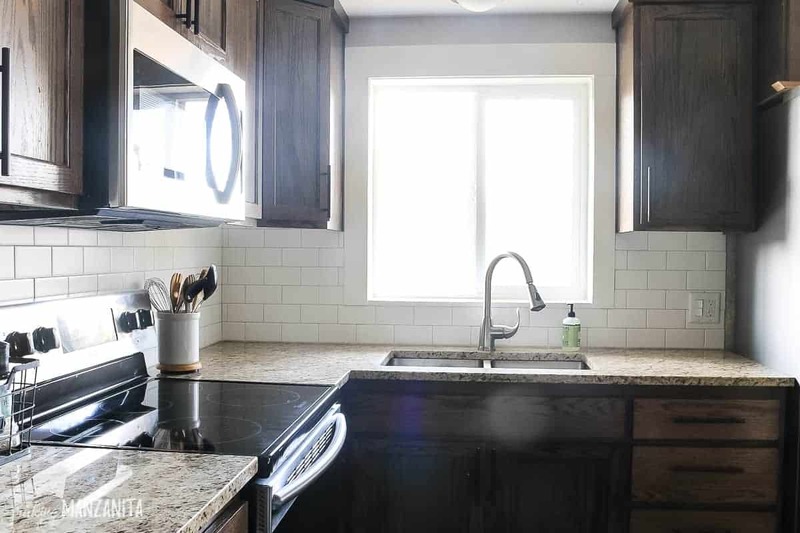 Should I use thinset mortar or mastic (aka tile adhesive) for my kitchen tile backsplash? Well, that’s a super good question and something I wondered about before we ventured down this backsplash journey. This article does a great job of explaining the difference between mortar and mastic/tile adhesive. 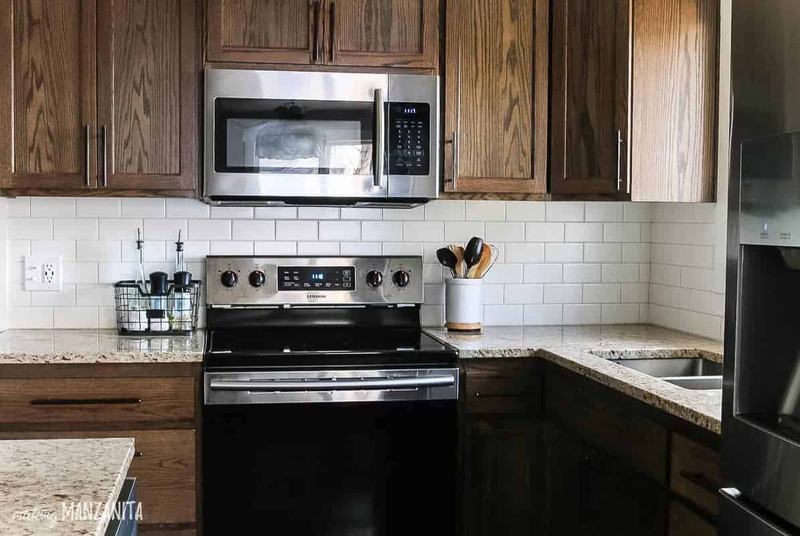 To put it simply – for something like a kitchen backsplash tile adhesive, like DAP’s Weldwood Ceramic Tile Adhesive is a good option. 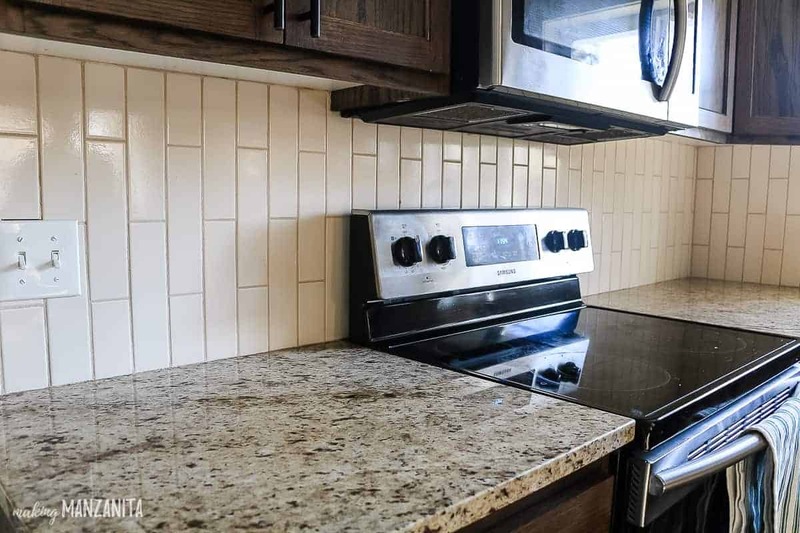 What surface can I install kitchen tile backsplash on? You may be wondering if you need to have drywall, plaster, concrete backerboard etc. to install your tile backsplash…. Typically when it comes to tile, the best surface to install is concrete, so you will install concrete backer board in places like a bathroom shower or floor. However, a tile backsplash can be installed right over a clean, level drywall or plaster since a backsplash does not get exposed to a lot of moisture. Green board is another type of material you may come across. It is better than plain drywall. 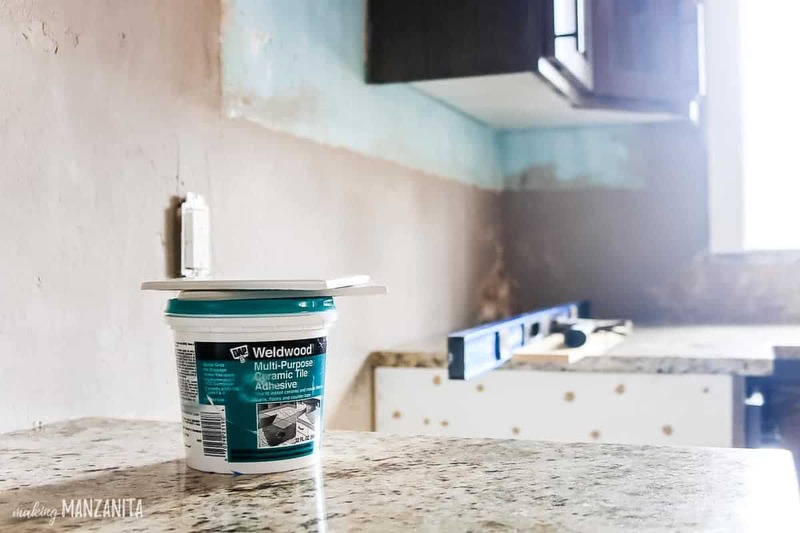 We didn’t have to worry about either of those scenarios because the two walls in our kitchen where we were installing the tile backsplash were concrete (the exterior walls of our home are concrete), which is a great surface for installing tile. 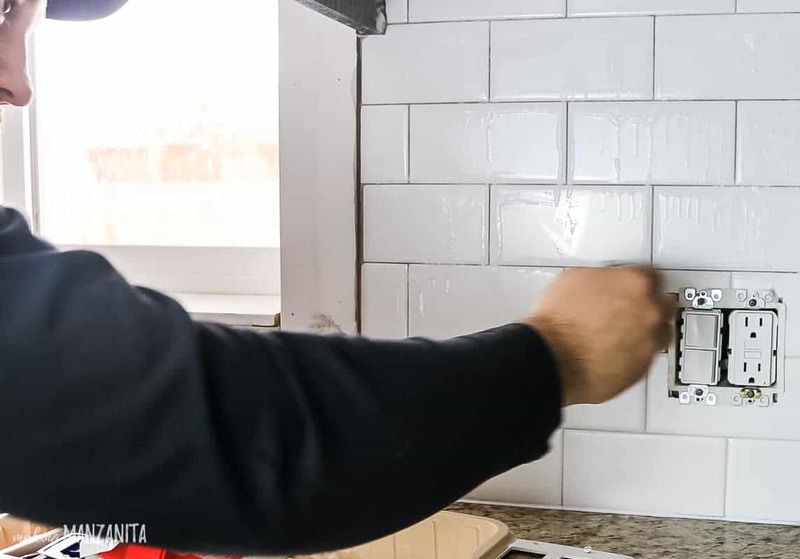 We just had to make sure it was level and patched – which you’ll see later in this how to install subway tile backsplash tutorial. Ok, now that we got those two questions out of the way, it’s time to jump into the steps & learn how to tile a backsplash! Let’s do this! 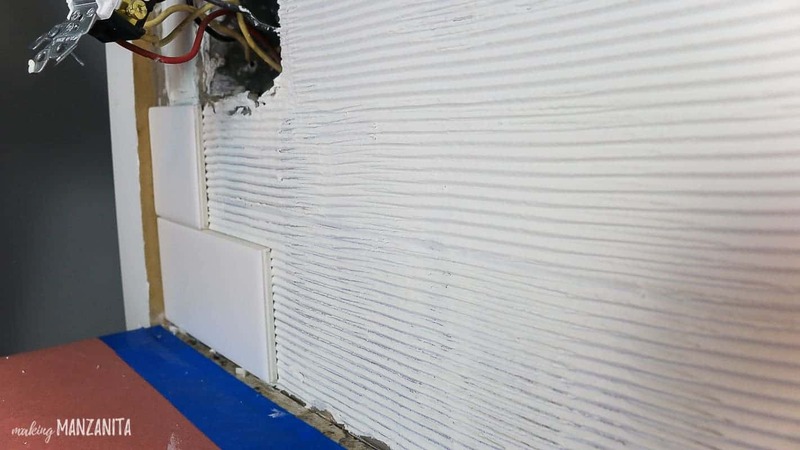 Put your tile and tile adhesive in the room you are going to be installing and maintain the temperature at 70 degrees or more for a full 24 hours before you start this how to install a subway tile backsplash. This helps everything to acclimate and produce a better result. 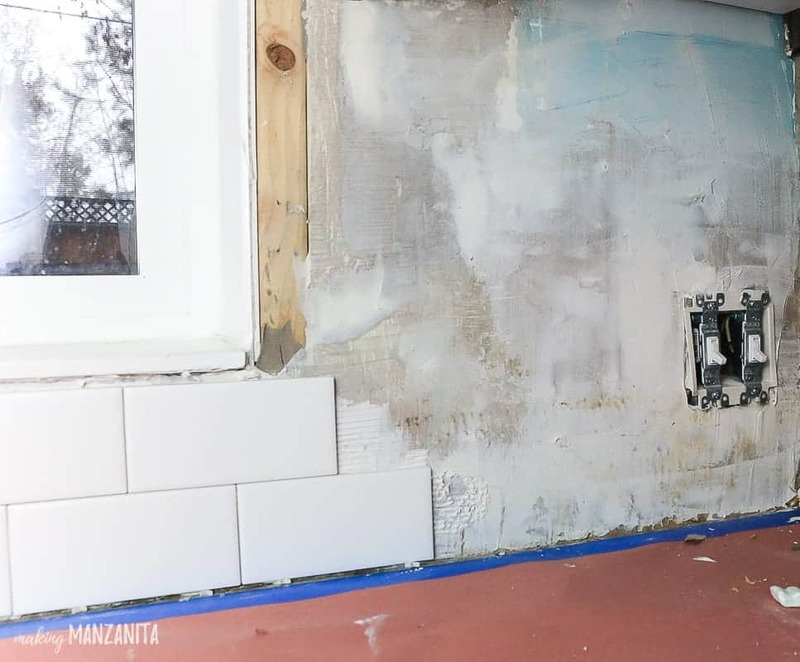 Note: if you still have ANY mastic or mortar still on the wall, you need to go back and work more on the tile removal process. 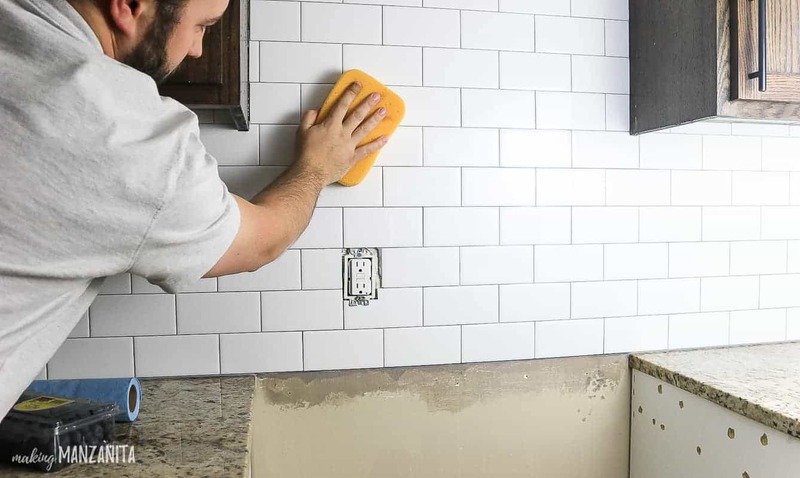 After all of the mortar is off, you can come back to learn how to install subway tile backsplash. Next thing you’ll need to do is level out your wall. Subway tile is extremely revealing. This is because of how small the tiles are and how small the grout lines are. Any high or low spots will show later through the grout lines or when lights reveal shadows cast on an uneven surface. Since we had cement walls, we used a cement patch. Start smoothing out your wall until its extremely level. Logan made sure the bubble in the level was perfectly in the center before moving on to actually putting the subway tile backsplash on. While your patching dries, take this time to prep the area. You need to cover your surfaces with some Red Rosin heavy weight paper and tape off any fixtures you want protected. Just like the tile removal process, this can get messy. 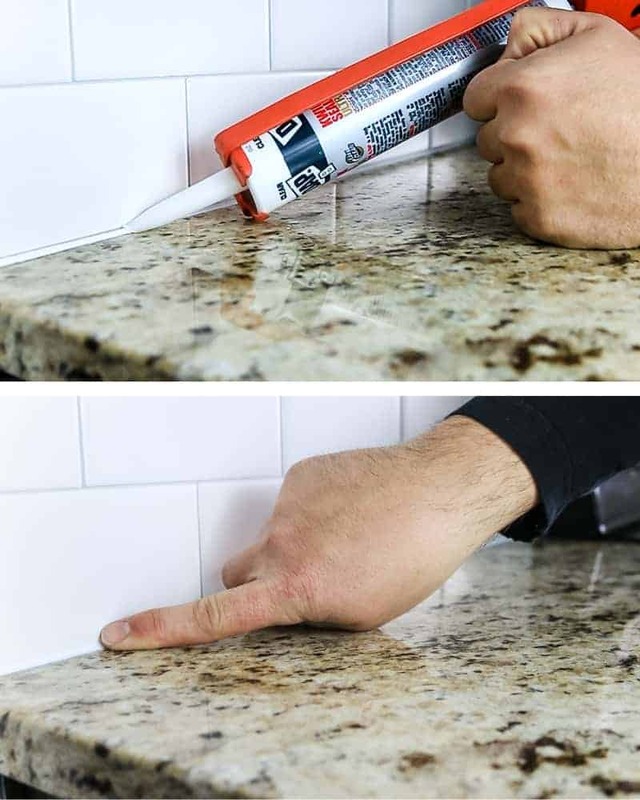 The ceramic tile adhesive is easier to work than mortar but you still might spill it and its better when its on paper instead of counter tops. Note: the above picture was taken earlier in the process when we were still removing the tile so you’ll notice there is no patch on the walls – that’s why. Now back to this how to install subway tile backsplash. 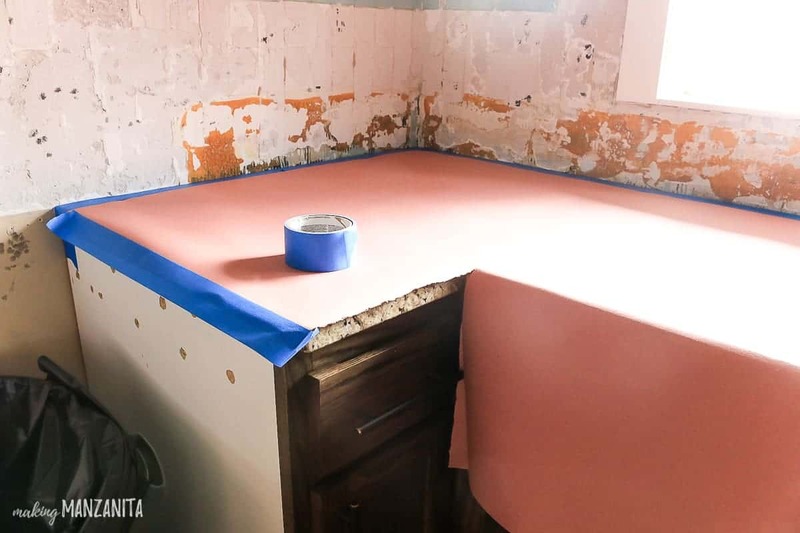 After the patch material has dried completely (we waited 24 hours) and you prepped the area, start by using the straight edge of your trowel to put a skim coat of the ceramic tile adhesive on the entire surface of the wall where you will be installing the backsplash. 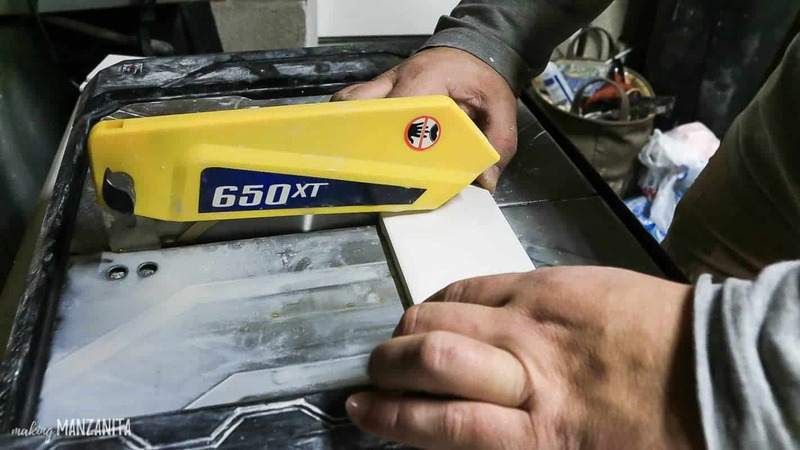 This helps to further level your project and the adhesion of your tile to the surface. DAP’s Weldwood Tile Adhesive requires 2-4 hours to dry before you can begin to set tile. You want the adhesive to dry enough so your trowel does not break the surface of your skim coat layer. With your skim coat layer of adhesive down and dried just enough, you are ready to start putting your tile on. 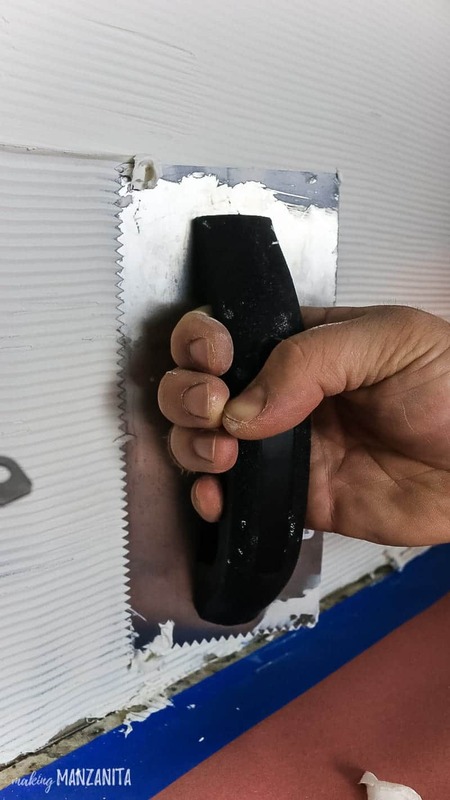 Take your 3/16th v-notched trowel and apply more tile adhesive to the small area of the wall. Only put the adhesive down over a small area at a time, no more than what you can complete in about 20 minutes. After about 20 minutes it will be too dry to bond properly to your tile. You don’t want to be rushed too much, so work in small sections. You want to cover the wall completely with grooves in the adhesive. To do that, you’ll start by applying the adhesive with the flat side of the trowel first. Then, turn the trowel around so the grooves are down and hold at a 45 degree angle. Slide the trowel over the adhesive to create the grooves. Once the grooves are in, start pressing on that subway tile. Starting with the bottom tile on a level surface (we always start with the bottom row), add your tiles one by one. Underneath our bottom row of tile we used tile spacers set in it’s side right on top of the countertop so the tile would sit slightly up off the countertop and that areas could be grouted and caulked. 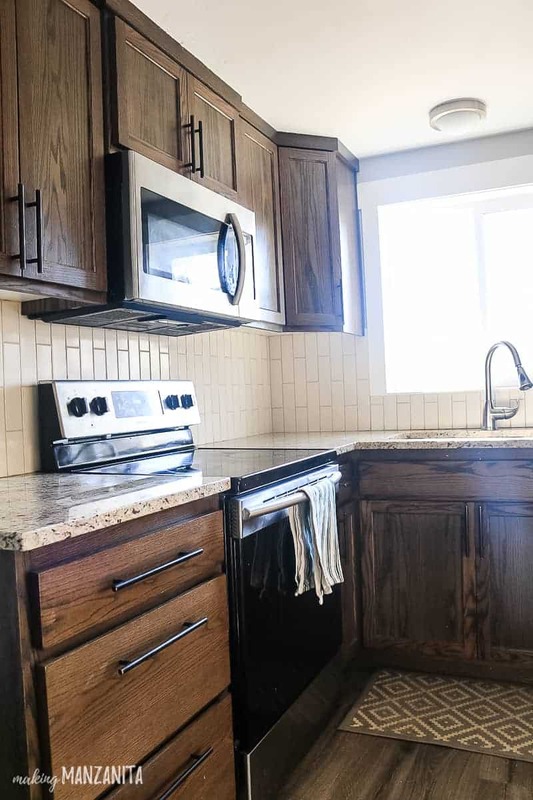 You don’t want to have the tile sit right on the countertop. When you press them into place onto the adhesive, include a very slight twist motion once you get each tile on the adhesive. This helps achieve the maximum mount of coverage on the back of your tile. You will need at least 95% coverage to ensure a good bond. You can find out how well your coverage is by taking a tile off every now and then after you put it on to see the coverage. When you put each tile on start with the lip just over the top of the tile you just placed and push in at an angle. This helps prevent adhesive from getting in between the tiles. Continue this process until you have covered your entire backsplash area with tile. You’ll need to cut down some pieces on the edges and corners with a tile saw. Be sure to take the tile saw slow to avoid chipping tiles. Wait 24 hours before moving on so the tile adhesive has a chance to dry. There’s a chance that some of the tile adhesive came up in between two tiles when you installed. If so, use this handy little scraper to clear that off before moving on to grout. After the tile has set for at least 24 hours, you can move onto grouting. When mixing up your grout, be sure to follow whatever the instructions included with your grout because the instructions may differ based on what you are using. If you mix the grout improperly it can lead to all kinds of complications. Once mixed, take your grout float and work the grout into the gaps between your tiles holding the float at a 45 degree angle. Remove the excess grout by holding the float at 90 degrees and take off as much excess grout as you can. Work quickly or have someone help you. Depending on the brand of grout you use, you will have a limited time frame to take a sponge and clean up your grout lines. Be sure to wipe off your grout before this window of opportunity closes or you will be forced to scrape it off. Trust us….we’ve learned the hard way on another tile projects (this shower tile installation) and spent an entire night scraping off all the grout lines because we waited too long to wipe it off. 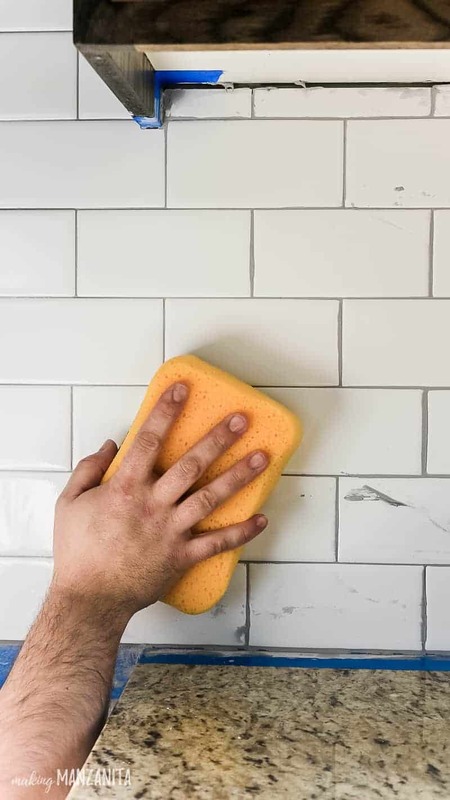 To remove the excess grout, just take your sponge, dip it in water, squeeze most of the water out until your sponge is slightly damp, and clean off the excess grout. If you need to clean up grout lines any further, just take your index finger and press the sponge along your grout lines. Next you’ll wait for a couple hours and then you will clean off the grout haze left on the tile. You can buy specialty cleaners to accomplish this. Or just do what we do and mix us distilled white vinegar with water. Usually we mix it at about 5:1 ratio, 5 parts water 1 part vinegar. Then you’ll wipe that mixture over the tile with a sponge. This should remove that grout haze. Now its time to wait before the grout can be sealed OR the backsplash can be caulked. Follow the instructions on whatever product you buy to seal but a general rule is wait 3 days then seal/caulk. But, the truth is that the longer you wait, the better. The more opportunity you give to the grout to dry, the more sealer it will pull in. We actually waited about 2-3 weeks after installing our subway tile backsplash before we sealed our grout. It is important to note though, you have to be very careful not to get the with the grout wet if it isn’t sealed yet. The part that we were really worried about was the area right behind our sink where the faucet is. (naturally!) This is an area that can get splashed with water very easily, so we kept a few towels there at all times to protect the unsealed grout. Next you need to caulk the bottom, where the tile backsplash meets the countertop. We cleaned the area well with mineral spirits. You could also use rubbing alcohol too. Make sure it is dried and then tape off the area with painter’s tape. Next, run a thin bead of DAP’s Kwik Seal Ultra Caulk (we used clear) where your tile meets your counter top. Now if you’re wondering if this is actually necessary… the answer is YES. 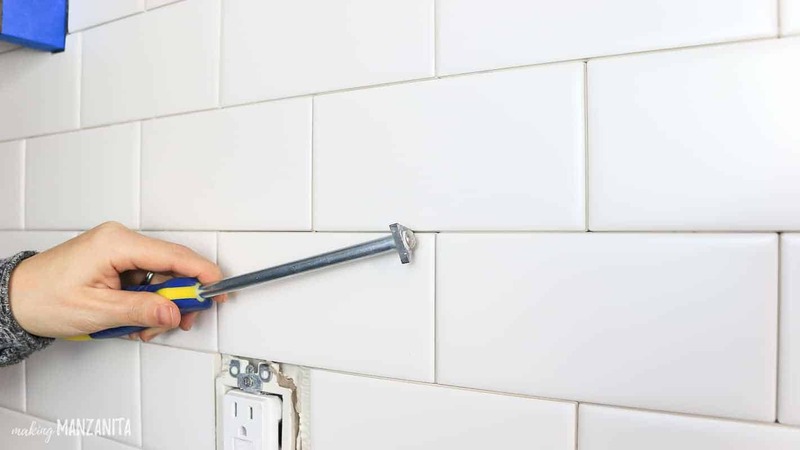 If you just leave the grout and don’t caulk, you can expect to replace it in the future. The caulk will expand and contract with the temperature changes and its a better seal overall (especially where there may be water splashes, like behind the sink). 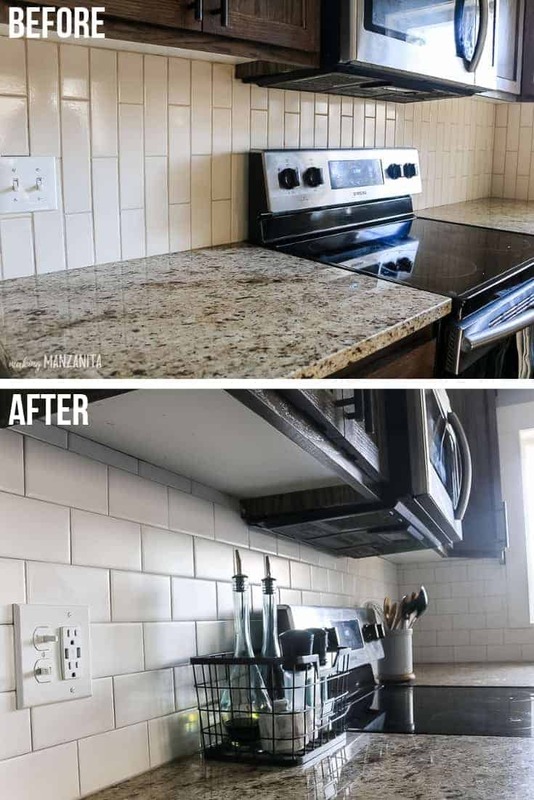 Before we replaced our tile backsplash, the grout was cracked and had big gaps and after just 1 year because it was not sealed with caulk by the flippers we purchased this house from. Do not skip this step! The final step with any tile backsplash is to seal the grout. We used this grout sealer and simply applied it with a foam paint brush directly to the grout lines. Just wipe clean when finished. Hooray! 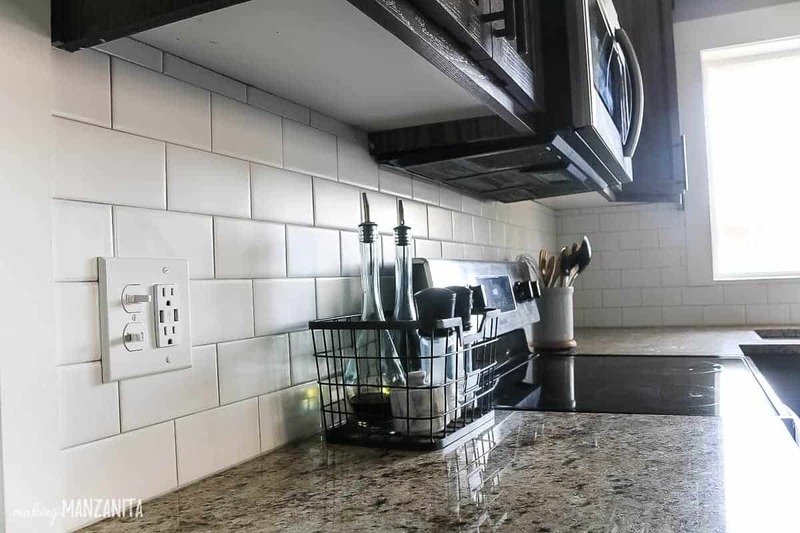 You are done learning all of the steps for how to install subway tile backsplash! See, it wasn’t that hard, right? 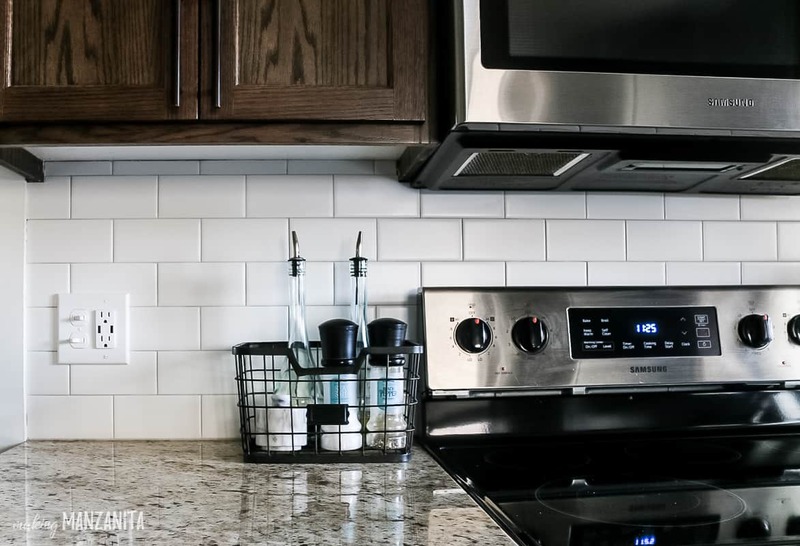 Installing your own subway tile backsplash is a pretty time consuming project because there’s a lot of waiting & drying & waiting & drying….but boy howdy, is it worth it?! Yes! It makes SUCH a big difference, right? Ok, before we sign off….let’s take another look at the before and afters, shall we? 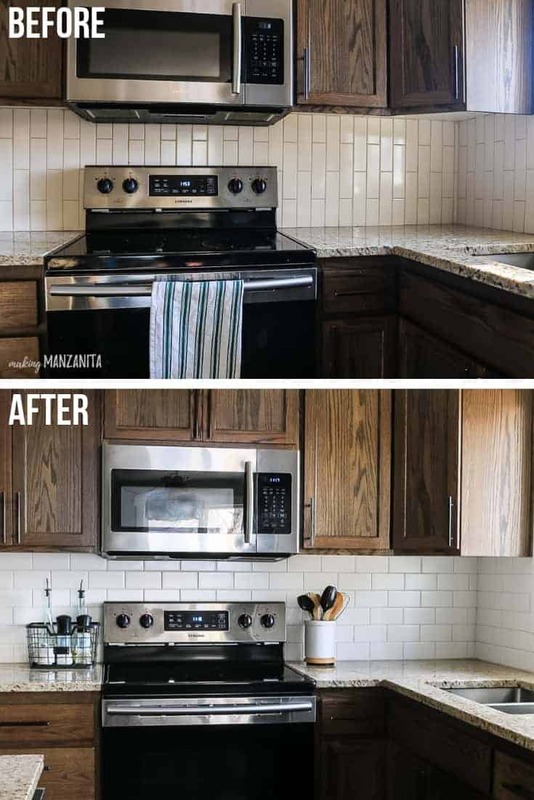 Did you learn something new in this how to install subway tile backsplash tutorial?